Tension pneumothorax (tPTX) remains a significant cause of potentially preventable death in military and civilian settings. The current prehospital standard of care for tPTX is immediate decompression with a 14-gauge 8-cm angiocatheter; however, failure rates may be as high as 17% to 60%. Alternative devices, such as 10-gauge angiocatheter, modified Veress needle, and laparoscopic trocar, have shown to be potentially more effective in animal models; however, little is known about the relative insertional safety or mechanical stability during casualty movement. Seven soft-embalmed cadavers were intubated and mechanically ventilated. Chest wall thickness was measured at the second intercostal space at the midclavicular line (2MCL) and the fifth intercostal space along the anterior axillary line (5AAL). CO2 insufflation created a PTX, and needle decompression was then performed with a randomized device. Insertional depth was measured between hub and skin before and after simulated casualty transport. Thoracoscopy was used to evaluate for intrapleural placement and/or injury during insertion and after movement. Cadaver demographics, device displacement, device dislodgment, and injuries were recorded. Three decompressions were performed at each site (2MCL/5AAL), totaling 12 events per cadaver. Eighty-four decompressions were performed. Average cadaver age was 59 years, and body mass index was 24 kg/m. The CWT varied between cadavers because of subcutaneous emphysema, but the average was 39 mm at the 2MCL and 31 mm at the 5AAL. 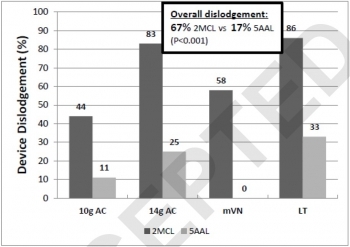 Following movement, the 2MCL site was more likely to become dislodged than the 5AAL (67% vs. 17%, p = 0.001). Median displacement also differed between 2MCL and 5AAL (23 vs. 2 mm, p = 0.001). No significant differences were noted in dislodgement or displacement between devices. Five minor lung injuries were noted at the 5AAL position. Preliminary results from this human cadaver study suggest the 5AAL position is a more stable and reliable location for thoracic decompression of tPTX during combat casualty transport.